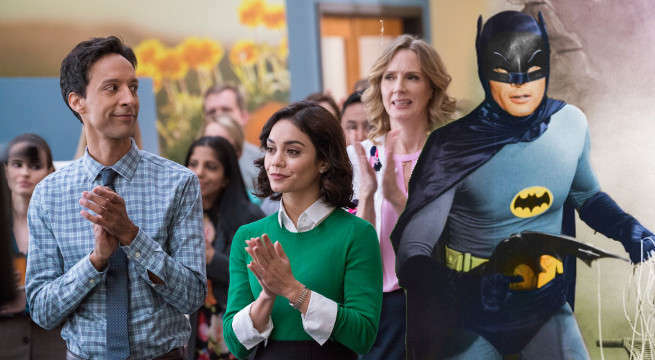 Powerless premiers this Thursday on NBC, bringing the team of Wayne Security to televisions in their quest to protect the ordinary citizens against the superheroic collateral damage that surrounds them. To promote the forthcoming series, NBC has debuted a new clip (via IGN) introducing the company’s employees with narration from none other than Adam West, the original television Batman. West’s vocals are accompanied by classic artwork animated and embellished to show the citizens in the background of the superbattles. It also shows clips previously revealed from the show’s plot, but West subverts the dramatic nature of his delivery by showcasing the plight of the common man in these fights. Check it out. The cast: Vanessa Hudgens, Alan Tudyk, Danny Pudi, Christina Kirk, and Ron Funches. Justin Halpern, Patrick Schumacker, Len Goldstein, Marc Buckland and Dean Lorey are executive producers of Powerless. Buckland served as the director of the pilot. The series is produced by Warner Bros. Television and is based on the characters from DC. Powerless premieres this Thursday, February 2 at 8:30/7:30c on NBC.